8 Inches of hair growth in a year! What was her amazing Secret? Those of you who've read some of my previous posts may have seen messages sprinkled within the posts about using the power of your thoughts to help create the perfect head of hair you want. I really believe it's crucial to focus the attention of the mind on the experience you want, not what you currently see. I was clearly reminded of that message the other day. While browsing the hair forum, I stumbled across a post that immediately grabbed my attention. With a title like "8 inches of growth so far this year," I couldn't help but to click just to see what's going on. The moment I'm in the thread, my attention was instantly focused on her amazing signature picture which spoke a thousand words. In your entry on the LHCF progress post, you mentioned that you never really took care of your hair prior to January, how did you develop such a firm belief that you could reach waist length without ever having done it before? Generally speaking, I’m a very confident person. I believe that if it can be done, I can do it. Upon joining LHCF, I spent a great deal of time reading threads, paying particular attention to what was being said by the long-haired ladies. They were already where I wanted to be and spoke nonchalantly about length and maintenance. It seemed to me that growth was to be expected. I never really entertained threads that spoke of the struggles and frustrations that some feel. The idea of growth was planted in the fertile ground of an open mind and a can-do attitude. And then it happened. I read a thread about a member who claimed to go from sl to almost wl in a year. Well, that’s the way it came across in a thread that was asking about the original thread. I’m not sure of the actual lengths, and judging by the pics she has in her fotki, she was growing longer than a year but, I didn’t notice that right away. All I knew was that she was able to do it so, it could be done. I joined various challenges, including one called “Get an inch every month 2010”. Well! It seemed others were expecting an inch a month so, I was in! I could do it. I believed it and expected it. After all, I was taking care of my hair and hair is continually growing. Why wouldn’t I reach WL? The distance was less than twelve inches. Lol. You mentioned visualizing and expecting growth, did you spend a specific amount of time visualizing daily? What exactly did you see in your visualizations? Can you describe the process? I’m a mother of 5. The only uninterrupted time that I really have to myself is time spent in the bathroom. I take nightly bubble baths to unwind and relax. I thought this would be a wonderful time to visualize my life goals, including my hair goals. I created a vision board and hung it where I could see it while relaxing in my bath. My vision board consists of photos pasted onto a poster board and framed to resist moisture and look nice. In addition to that pic, I also make mini-goal length pics. I print out a decent length shot pic and use a marker to extend my hair to the next goal length (I'm sure it would work better with photoshop or something but, I have no skills with that). And from where I'm sitting in my tub, it looks good enough for visualizing. I sort of see that as spoon-feeding my mind believable bites. It's not too much of a jump for my mind to believe. It's usually just a few inches beyond my current length. So, when I was above apl, my mini-goal visualization pic was bsb length. And my current mini-goal length pic hangs between wl and hl and looks full. And, I also have written around the pic, the words "LONG", "STRONG", "THICK", "HEALTHY HAIR". So when I'm looking at the pic, I'm convincing myself that what I'm looking at is my current length. It's not too much of a stretch to believe and I get excited and start singing and thanking God for the beautiful mane. And by singing, I mean I made a little sing-songy song out of the words on my pic. 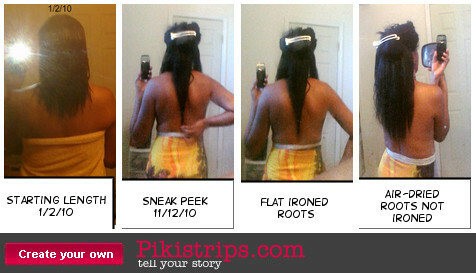 "I have long, strong, thick, healthy hair! Thank You, Lord. Thank You, Lord!" I do that daily and am literally speaking life into my visions. And before I'm done, I spend time focusing on the full goal pic and tell myself how beautiful my hair looks and what a good job I've done taking care of it. And of course, thanking God for my crowning glory. I don’t go into a trance or anything like that. I just view the photos as though it’s already a done deal, and I allow a wave of gratitude to spring forth. Also, from the beginning of my HJ, when I shower, I throw my head back and swish it around a bit while the water runs over it. The wet hair feels heavier and, in my mind’s eye, it’s longer, so I act that way. It’s fun to flip your long, luxurious hair in the privacy of your own shower. It’s important to have fun and to feel grateful. How did you keep your thoughts focused on growth for an entire year without become frustrated, distracted or unfocused? Well, a few things. Taking regular pictures reassured me that my hair was growing. I went a little overboard when I first started but, that was because I was excited to see growth. Eventually, I decided to stop looking at my hair every time I was in front of the bathroom mirror, particularly after spending time visualizing. The last thing that I wanted to do was convince myself that my hair is bsl and get out and find that I’m still apl, for instance. That allowed me to take the feeling of my new length with me into my day. And when in front of the mirror, I’d push my hair behind my back so that I couldn’t see the ends. My front is shorter so, I’d sweep that back and blend it with the rest of my hair. Also, staying away from the naysayers and plugging into positive support. It is crucial to protect your mind from poisonous thoughts and people. I surround myself with positive and encouraging people and avoid negative people and posts like the plague. You also stated that you "kept the ideas that my hair grows fast and that it's constantly growing in front of me." Can you elaborate and what that meant for you daily, monthly, etc? I kept these ideas in front of me by placing my progress pics in my siggy. I’m visually reminded of my growth over and over while on the boards. I always include my start picture along with my most recent pic. And when I look at that, I remind myself that my hair has grown since that last pic. Woohoo! Have you used the power of attraction to produce other dramatic results in your life beside the gorgeous hair? Absolutely! There are things on my current vision board that have come into my life with stunning results. For instance, I have a pic of a small group of women with the caption “Good Friends”. One of the ladies, from a distance, resembles me. I used a pen to extend her hair. I’m amazed to find that not only have I made close friendships with women since I posted the pic, but the friends that have come into my life actually resemble the women in the picture. I can associate a friend’s name with each woman in the picture. Now, I NEVER expected that! LOL. Now THAT’S what I call getting what I asked for! Another awesome example is my Lexus. My screensaver is a slideshow of pics that I created for visualizing. One of the pics is a Lexus. I edited the pic to put my name on the front license plate and thought nothing else of it. At the time, I was driving an SUV because of the size of my family. I longed to be in a car but, it wasn’t really practical. Long story short, my husband called me one day and asked me to meet him to look at a car that he thought that I might like. Keep in mind that I never shared my pic or my desire for a Lexus with him. I didn’t want him to think that I was into some sort of hocus pocus mind thing. Also keep in mind that we were upside-down in our SUV value because the high cost of gas dropped the value of our vehicle. And, to get a LEXUS while upside-down in our SUV was just not supposed to happen. Anyway, the car was perfect! My color, style, interior~ BEAUTIFUL! But surely the numbers would stop us. Nope! I felt like a miracle happened. I didn’t make the connection with the picture until I went out and bought a vanity plate. I’m very aware that there is power in the words that I speak and what I believe in my heart. I believe this principle is biblical and is available to us all. God said that whatever you ask for in prayer, believing, you will receive. I believe this 100%. And my faith coupled with His grace has produced this expected blessing and MANY others in my life. ~ And I’m thankful. I'm thankful to NJOY for sharing with us her amazing experience. I don't know about you but I was once again excited about my ability to create the hair I desire simply by reading her story. If you'd like to know more about NJOY's journey, you can check out her detailed regimen here. Wow, I saw this pic too and thought nothing of it. I'm glad you decided to track her down and interview her. I've got a vision board too, but it only has a girl with a fro on it, no length goals. NEW BOARD COMING!! lol. That is amazing. I had a vision board last year, am thinking it's time to tweak it and get ready for the new year with it on my wall as a constant reminder. Now I love me some NJOY and believe in being positive, but she also had a pretty great actual regimen that helped her reach her goal so quickly as well. I'm all for positivity and agree that it all starts with BELIEVING we can achieve it, but it does take a lil more than just that and this post can read a little deceiving. I enjoyed it as I do all your posts, but think that it should have included MORE of her real regimen as well (growth aid & protective styling), which is a pretty awesome regimen! Not criticism, just a critique. Great point! If we don't REALLY believe we can achieve something we won't stick to the regimen required to reach our goals....whether academic, work related, weight loss or hair. Good point! This research article done out of Belgium on the power of visualization to treat baldness and alopecia is remarkable. It may not pertain to growing hair longer in and of itself, however it proves the mind-body connection in regrowth. @ Anon-Thanks for sharing this article with us. OMG Thank you so much to you and NJOY for sharing this with all of us! May she be even more Blessed then what she already is! I have a vision board from way back but put it in my closet and forgot all about it. Not good!!! Going to revamp it and modify it. Love the part were she stuck her face over the picture omg that's so smart and creative!!! Can't wait to get home and do it!!!! I am printing this off. Wow, please can I come into contact with her, I need someone like that on Facebook or something! I'm serious, this is inspirational! Thank you all for your kind words. This article was again brought to my attention recently. Again, I'm SO grateful that it was handled and received in such a beautiful manner. Wishing you all the best in your journeys ~ both hair and life. Thanks for this. I feel like I've been obsessed with my hair growth lately. I'm currently taking biotin/msm/VitC/full spectrum omega while drinking bamboo tea. I've just started the inversion method and I have been wearing a protective style for 8 weeks, I plan on doing so for 16 more weeks. When I started all of this I was past APL almost BSL, my goal is waist length. I've been visualizing and imagining that I can feel my hair growing. I hope it works. I'm usually pretty good at setting my intentions for things I want and getting it.